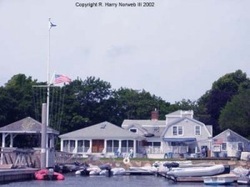 The Beverly Yacht Club is one of oldest and most distinguished yacht clubs in America. It was founded in 1872 in Beverly Massachusetts by a group of sailors from the Eastern Yacht Club who wanted to race small boats under 30 feet on the waterline. Our founding member and first commodore was Edward (Ned) Burgess. Ned is best known as the designer of three successful America’s cup defenders Puritan, Mayflower, and Volunteer in the late 1800′s. Ned was an active racer, started the “wet pants league” of small boat racing, and with it a long history of excellence and sportsmanship at our club. Within ten years of our founding, BYC had so successfully championed small boat racing that more sailors from the south shore and Buzzards Bay had joined the club. In 1882 and 1883, the Beverly Yacht Club hosted what was believed at that time to be the largest union regatta recorded in America. There were a reported 113 and 171 small and large boats in these regattas. In 1895 the Beverly Yacht Club moved to Pocasset, and in 1913 to Marion where it remains today, name unchanged. During the 19th century, Sippican Harbor was the third most productive whaling center in the United States. Twenty-three whalers made over 100 trips to the South Atlantic and Pacific. You will use wharfs formerly reserved for whaling vessels and their cargos of oil and baleen. In recent years, Sippican Harbor has become completely devoted to yachting activities, with no commercial shipping. It is one of the best yachting harbors on the east coast. Today, Marion is a residential community with a winter population of about 5200, swelling to 8000 in the Summer. The buildings of Tabor Academy, a college preparatory school, can be seen on the west side of the harbor.